An interview with an electrician on the ongoing dispute over pay cuts and attacks on conditions in the sector. A number of major UK building contractors have issued their electricians with new contracts. What’s wrong with the new ones? What are the main changes suggested in them? The main reason for the new contracts is to save money on labour costs, as this is the only expense that companies can control. They see 75% of the work currently undertaken by their highly trained employees as semi-skilled and they do not like the fact that they have to pay skilled workers to carry it out. So they are introducing an ‘Installer NVQ2’ Grade to carry out the 75%. Therefore reducing our workload by three quarters and passing it on to semi-skilled, cheap labour. Would you be happy with your electrics being installed by a non-qualified person? Another main area being attacked is apprenticeships. There will be no more electrical and plumbing apprenticeships offered by these companies as they want to build a work force of multi-skilled workers, trained in a little bit of everything but specialising in nothing. Other areas also being attacked are overtime rates, independent grading of tradesmen, redundancy rules, unfair dismissal, trade status and travel pay just to name a few. Which unions are electricians represented in? Are there negotiations ongoing? Unite the Union represent the Electricians, Plumbers and Fitters affected by the current dispute. Unite withdrew from talks with the companies earlier in the year due to the companies stance that the installer grade was non-negotiable. Unite want a progressive path in the industry; the opportunity to go to college and gain qualifications to advance in your chosen trade. The companies want ‘Installers’ to be just installers, to never progress and forever be stuck at NVQ2 level. What has happened so far to fight the new contract agreement? 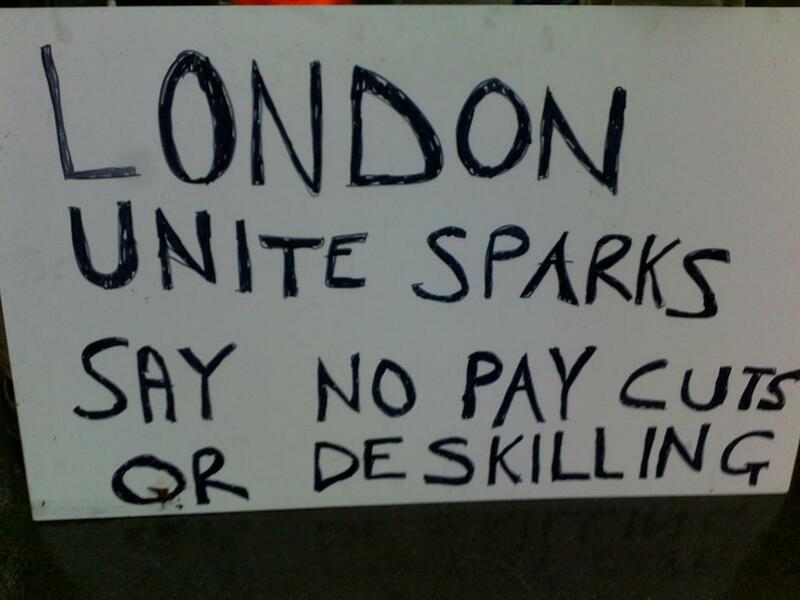 There have been picket lines at a number of building sites; have they been successful? There have been protests/pickets outside building sites and power stations up and down the country in nearly every major city since 24th August. There have been numerous unofficial walk-outs involving thousands, flying pickets, occupations and mass civil disobedience. As a direct result of the protests one of the original break away companies (MJN Colston) decided to stay with the existing agreements due to pressure from one of their major clients, Marks and Spencer’s. This week it emerged that because of the Manchester protests, Balfour Beatty have lost a contract at Carrington Paper Mill and are having payments withheld at Sellafield Power Station. There are also rumours that many other big clients are also putting pressure on the companies to resolve the industrial unrest before it escalates to strike action or face losing even more contracts. On November 9th, Unite have called for a national rally at the Shard and march to parliament. But the rank and file will be out much earlier in the morning? From the beginning of this dispute, the protests have been led by the rank and file. So it was decided that we would continue our weekly early protest and combine it with the Unite backed day of action. We have been outside building sites at 6:30am for the last 11 weeks and see no reason to alter our plans. The march will go past Blackfriars towards parliament. Will there be a chance for it to meet the education march? The official Unite march heads to Parliament from Blackfriars whereas the Rank and File plan is to meet up with the Education march at 12:30 at ULU. The general consensus is that talking to the MPs will not achieve a thing as they are doing exactly the same thing to their own employees in the public sector. What are the next steps in the dispute? Are further protests and actions planned? Unite are going to be balloting Balfour Beatty employees for strike action this month as they are seen as the main instigators in the whole affair. There will be protests every week across the United Kingdom until we get the companies to back down and stop bullying their employees.